Is Your Library Making News? 54.73% - Percentage of Hoosiers that are registered library cardholders (2.21% fewer than 2014). 34,928,331 – Indiana public library visits in 2015 (a 2% decrease). 3,070,231 – Total program attendance, an increase of 3%. The number of programs offered was also up 4%. Compared with total visits, nearly 1 in 10 library visitors attended a program. 77,652,888 – Number of total items circulated (a .61% increase). 24% – Increase in Electronic materials circulated (13,264,127 total). Ebook holdings are also up 22%. Computers and WiFi – While public computer terminal use dropped by 4.33%, wireless internet use increased by 17.41%. $14.31-$21.15 - Average hourly salary range for a General Reference or Adult librarian. 1,463 - The number of FTE librarians employed in Indiana public libraries (a 2% increase). The Institute of Museum and Library Services has also just released their summary of the 2013 Public Libraries in the United States Survey. In this publication, IMLS takes a longitudinal look at libraries, their funding, and services, with an emphasis on trends including the impact of the recession. Anyone with questions regarding the statistics may contact Jen Clifton at jclifton@library.in.gov or (317) 234-6550. The Indiana Division of Historic Preservation and Archaeology is sponsoring an essay competition to celebrate Indiana’s great and interesting historic sites. The competition is open to any 4th grade public, private, or home school student in Indiana. Essays should discuss a historic place—50 years old or older—in Indiana and why it is his/her favorite historic place. This is not a history of the site, but rather why the STUDENT likes the place! Essays should range from 100 to 400 words, handwritten or typed, and must be the student’s original work. Plagiarism will result in disqualification. Essays must include student’s name, teacher’s name, and the school’s name, address, telephone number, and email address. During the first week of May, judges will choose 1st, 2nd, and 3rd place winners, who will all receive prizes. All work becomes the property of the DNR-DHPA and may be used on the Division’s website, e-newsletter, or other venues. This one-day conference will explore and expand knowledge of women’s contributions to Indiana through their labor via speakers, presentations, and panel discussions. The theme, “Hoosier Women at Work” is broadly defined but not limited to the following topics: volunteering for public welfare, contributing to Indiana’s agricultural heritage, caring for home and family, and wage earning occupations. Conference keynote speaker, Dr. Nancy Gabin, Associate Professor and Director of Undergraduate Studies at Purdue University, will provide an overview and remarks at the luncheon. 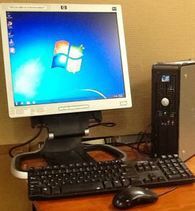 The Indiana State Library, in partnership with Net Literacy, is offering a second round of free, rebuilt public access computers. These computers are available to any Public or Institutional library in Indiana (sorry, no schools at this time). These refurbished computers are all running Windows 7 Professional and have a minimum of 1GB ram, 100GB or larger hard drives, DVD drives, Ethernet cards, and antivirus software. A few of the machines have SD Memory Card readers. The machines arrive internet ready and are equipped with flat screen monitors, keyboards and mice. Net Literacy is a student-run, Indiana based organization, started back in 2003 when a central Indiana middle school student, Dan Kent, was asked to teach a group of mobility-impaired senior citizens how to use the Internet. From that seed, Net Literacy was born. Today Net Literacy boosts over 3,500 student volunteers who spend 100,000s of hours to rebuild donated computers and provide them to retirement homes, community centers, and since 2011, to public libraries all over the state. Quantities are limited and priority will be given to recipients that can make arrangements to pick the computers up at the Indiana State Library between March 1 and May 1, 2016. To request computer(s) for your library, please complete this short online questionnaire. Awardees will be contacted by email to schedule a pickup date. Click here to access the online questionnaire. Please visit Net Literacy’s website to learn more about the organization and their efforts to improve Digital Literacy nationwide. Contact Steven Schmidt from the Library Development Office (steschmidt@library.in.gov) if you have any questions about the State Library's program. © 2016 Indiana State Library. All rights reserved. The trademarks used herein are the trademarks of their respective owners. The Wednesday Word is a free publication of the Indiana State Library. Past issues are archived at the State Library's Newsroom.